If GEICO questions your auto body shop’s increased rates, you’ve got a good counterargument — from GEICO itself. So there you go. Higher expenses justify charging more; it’s not just the “cost of doing business.” You can’t argue with the “Oracle of Omaha” himself, Berkshire CEO Warren Buffett, who signed off on the 10-Q. Despite the competitive auto insurance market, Buffett has said that GEICO won’t follow the “I take a loss but make it up in volume” mindset of competitors whom he said slash premiums too deeply with the goal of luring customers. The 10-Q says GEICO saw losses and expenses grow $615 million, 16.6 percent, in January-March compared to the same time last year. Property damage and collision coverage rose 3-4 percent in the quarter from 2014, and claim severity rose 4-5 percent for collision and physical damage claims, according to Berkshire. The “costs incurred to generate the increase” might refer to advertising and other promotions to get customers. But don’t worry about GEICO. They’re still up $160 million for the quarter on underwriting alone — though last year, their pretax profit was $353 million. 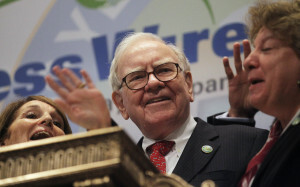 Berkshire itself made $5.16 billion after taxes for shareholders, up from $4.71 billion last quarter. The 10-Q also has a few more details about the cost of Berkshire’s purchase of the Van Tuyl Group, a major auto dealership chain. According to the document, Berkshire paid $4.11 billion for Van Tuyl, and it’s already paying off. Van Tuyl, now called Berkshire Hathaway Automotive, among with other companies helped contribute to service and retailing revenues rising $1.2 billion, or 35 percent, to $4.5 billion, the 10-Q said. Part of that $4.11 billion bought what was estimated at $1.03 billion in property, plant and equipment. Most of that is probably real estate, but some of it would include whatever was inside of the Van Tuyl auto shops. Buffett raises a good point on the salesman cost. Plus, that kind of vertical integration could also draw controversy similar to the Allstate-Sterling combination.